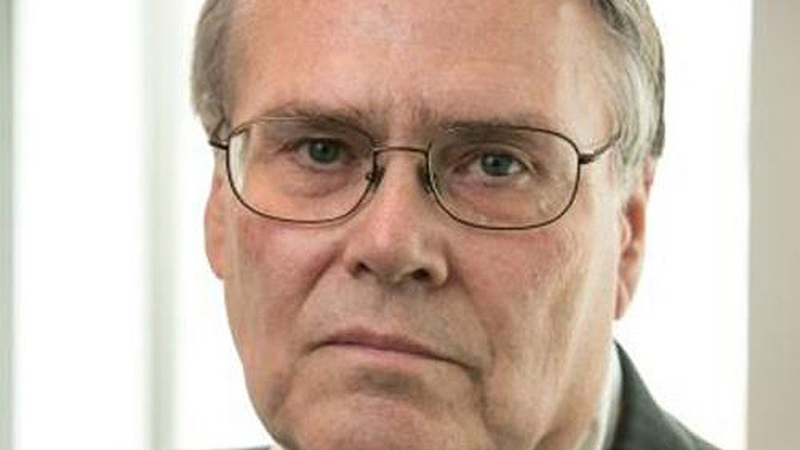 No doubt, AAR Senior Vice President Policy and Economics John T. Gray is trying to sort this all out. I don’t blame him for not smiling! 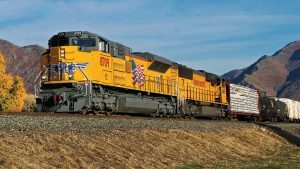 We traditionally have reported the Association of American Railroads weekly compilation of freight traffic statistics as “straight news,” with commentary restricted to what the AAR may include in the release, which is rare. In this case, there’s a lot going on here, enough to warrant some analysis. The figures are all here, along with supporting charts. But don’t take them at face value. 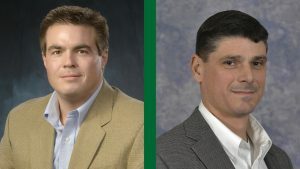 Most certainly impacted by extreme weather and flooding in the U.S. Midwest, U.S. carload and intermodal traffic dropped in three separate 2019 measurements—the week ended March 30, the month of March and the first quarter. In contrast, Mexican and Canadian railroads fared well during the week ended March 30, though U.S. declines more than offset their gains. Canadian carriers registered a quarterly gain. Mexican carriers registered a quarterly loss. North American rail volume for the week ending March 30, 2019, on 12 reporting U.S., Canadian and Mexican railroads, totaled 348,723 carloads, down 5.2% compared with the same week last year, and 358,001 intermodal units, up an encouraging 1.5%. Total combined weekly rail traffic in North America was 706,724 carloads and intermodal units, down 1.9%—not good, but not terrible. Total U.S. weekly rail traffic was 509,958 carloads and intermodal units, down 4.6% compared with the same week last year. 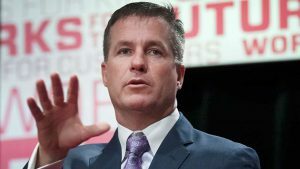 But total carloads were 241,906, an 8.9% nosedive, while intermodal volume was 268,052 containers and trailers, down an almost negligible 0.4%. 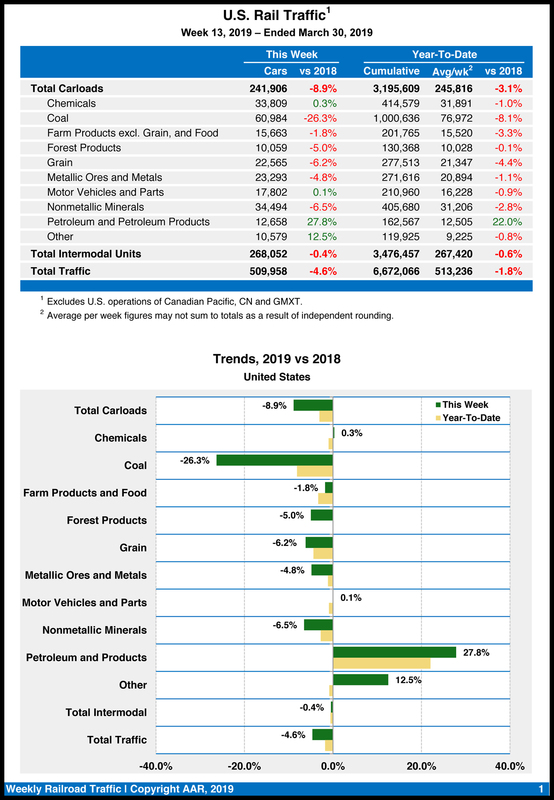 Four of the 10 carload commodity groups posted an increase: petroleum and petroleum products, up 2,756 carloads to 12,658; miscellaneous carloads, up 1,175 carloads to 10,579; and chemicals, up 102 carloads to 33,809. 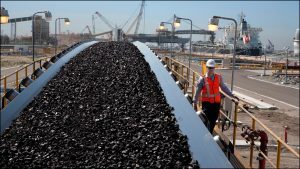 Among the commodity groups that posted decreases: coal, down 21,769 carloads to 60,984; nonmetallic minerals, down 2,409 carloads to 34,494; and grain, down 1,487 carloads to 22,565. 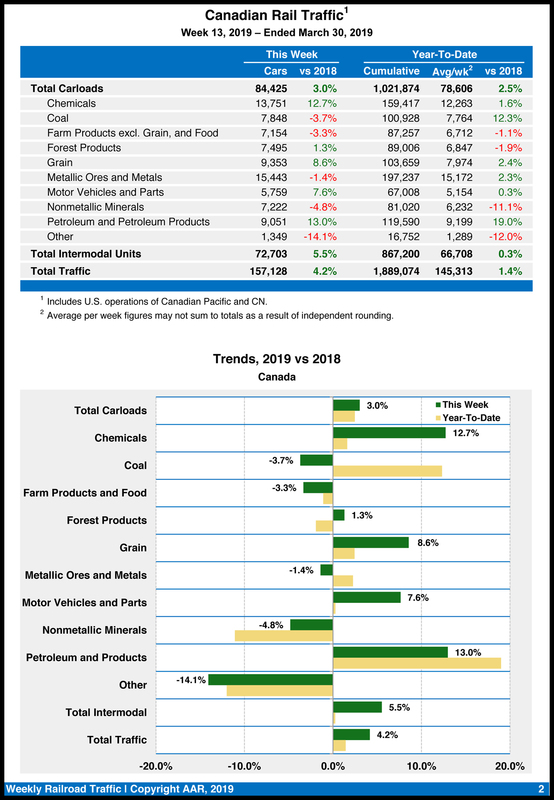 Canadian railroads, on the other hand, reported 84,425 carloads for the week, up a healthy 3%, and 72,703 intermodal units, up an even healthier 5.5%, compared with the same week in 2018. U.S. railroads originated 957,144 carloads in March 2019, down a depressing 8.9%, or 93,616 carloads, from March 2018. U.S. railroads also originated 1,065,790 containers and trailers in March 2019, down a less-disturbing 1.5%, or 16,387 units. Combined U.S. carload and intermodal originations dived 5.2% to 2,022,934, or 110,003 units. 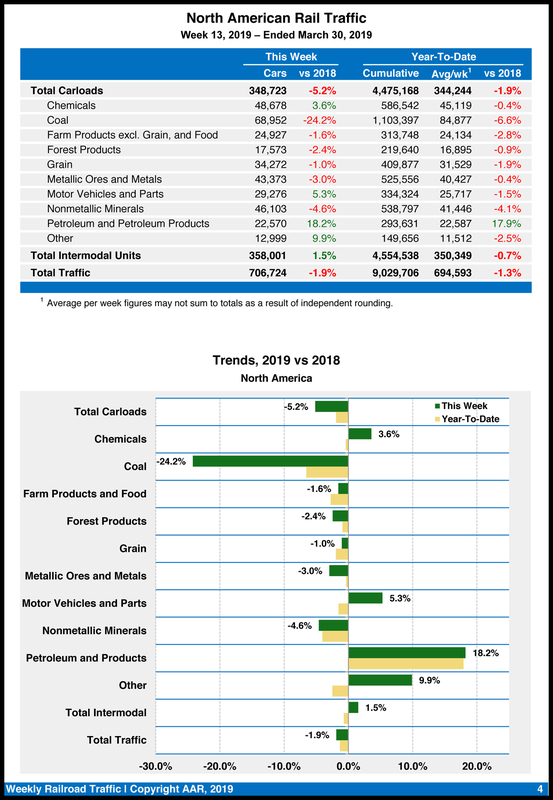 In March 2019, only four of the 20 U.S. carload commodity categories tracked by the AAR each month saw gains: petroleum and petroleum products, up 8,290 carloads—a whopping 21.1%; motor vehicles & parts, up 1,215 carloads or 1.8%; and nonmetallic minerals, up 927 carloads or 6.3%. Commodities that saw steep declines: coal, down 64,804 carloads—an equally whopping 19.1%; grain, down 11,837 carloads—almost as depressing as coal, at 12.6%; and crushed stone, sand and gravel, down 8,732 carloads—9.1%. The AAR took special pains to back coal and grain out of its U.S. monthly calculation. Excluding coal, carloads were down 28,812 carloads, or 4.1%. Excluding coal and grain, carloads were down 16,975 carloads, or 2.8%. Bear in mind that coal and grain are important bulk commodities for railroads. But more important, grain (ag products in general) will always be there, and railroads are the best way to move it. Coal? It’s generally acknowledged that coal has a limited long-term lifespan and will at some point disappear altogether. 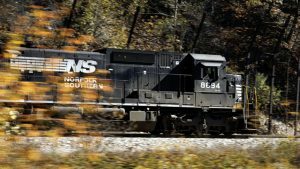 That’s good for the environment but not good for the railroads, unless they are able to grow other business lines and take more volume away from trucks. People have to eat, but there’s more than one way to generate electricity (natural gas, solar, hydro, wind). First-Quarter 2019: U.S., Mexico down, Canada up. Total combined North American volume was 9,029,706 carloads and intermodal units, down 1.3% from 2018. Combined U.S. traffic was 6,672,066 carloads and intermodal units, a 1.8% decrease. Total U.S. carload traffic was 3,195,609, down 3.1%, or 100,800 units; and 3,476,457 intermodal units, down an almost negligible 0.6%, or 19,892 units. Canadian railroads reported cumulative volume of 1,889,074 carloads and intermodal units, up 1.4%. 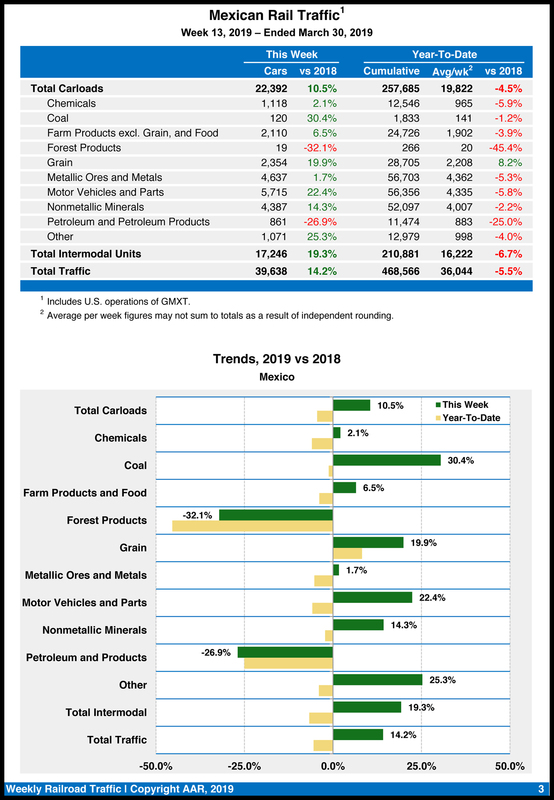 Cumulative volume on Mexican railroads was 468,566 carloads and intermodal units, down 5.5% from the same point last year. The gyrating traffic figures have left many economists and industry observers scratching their heads. I’ll leave it up to the experts to decipher what’s going on. You know how to reach me. Just let me know if you’re on or off the record. I’ll publish the results in a future column. On to the second quarter. Hope springs eternal!